I have knocked Moleskine for ages for the lack of value in their product offerings but their gel ink pens keep sucking me back in. At $15 they are way overpriced - it feels like a $5 pen, if that - but the ink cartridge is the best I’ve tried in ages and I find myself using it all of the time. The Click Roller isn’t my favorite of the three I own. That honor goes to the Classic Roller, which made a surprise appearance on my last Top 5 list. I thought the Click might take the top spot, but I have trouble with the knock sticking when I want to retract the pen. I’ve taken it apart in an effort to adjust it but it still sticks way too much. Congratulations Moleskine on manufacturing a product I enjoy using. 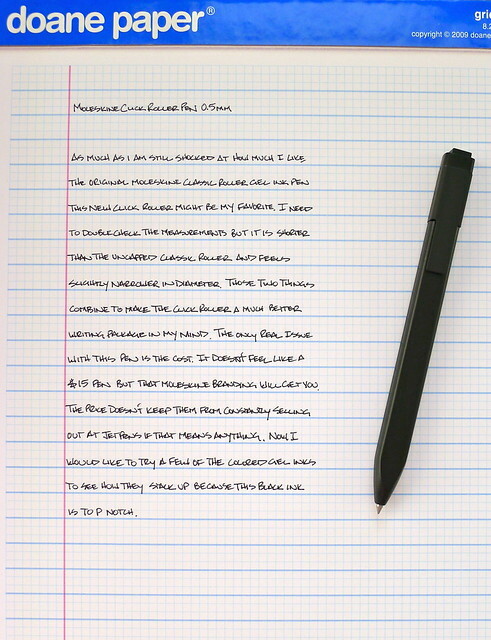 Posted on August 27, 2012 by Brad Dowdy and filed under Moleskine, Pen Reviews.